The documents appear to discount claims made by some Republicans that the FBI failed to properly disclose sources of information used to seek it. 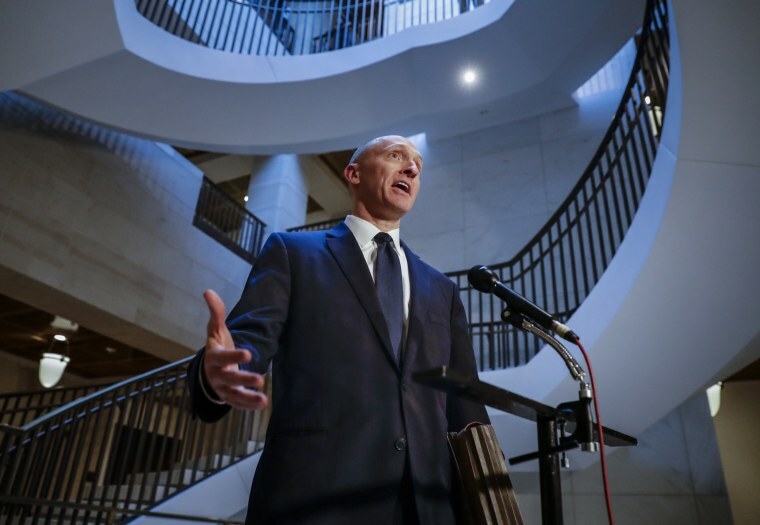 The FBI on Saturday made public redacted documents related to the electronic surveillance of former Trump campaign aide Carter Page, who was at the center of a controversy over how the FBI sought the secretive warrant. The documents released Saturday appear to discount claims made by some Republicans that the FBI failed to properly disclose sources of information used to seek the Foreign Intelligence Surveillance Act warrant, and it shows that authorities used other sources of information besides the Steele "dossier" in the application, which was granted by a judge. The warrant, which is heavily redacted in several areas, was released on Saturday following Freedom of Information Act litigation launched by The New York Times and other media organizations and it was released with the approval of a judge. The warrant contains many previously reported allegations about Page and his interactions with Russian interests. Page spent a few months advising the campaign of President Donald Trump. The warrant backs up a claim made by Democrats in Congress that the FBI did notify the judges of where some of the information came from — Christopher Steele, the former British spy who drafted the unverified "dossier" about Trump, and Steele’s associates. And it backs up the claim that the FBI used information from other sources that were wholly uninvolved with Steele, including published reports. A FISA warrant authorizes the FBI to conduct surveillance of a person whom the Department of Justice has probable cause to believe is an agent of a foreign power under the authority of the Foreign Intelligence Surveillance Act. The FBI suspected Page was a Russian agent, something he vociferously denies, even as he acknowledges having a relationship with the Kremlin. NBC News has reported that four separate federal judges signed off on the surveillance of Page and subsequent renewals. On Sunday, Page strongly denied being an agent of a foreign power and called the claims in the FISA warrant "so ridiculous" and "spin." "It's literally a complete joke and it only continues, it's just really sad," he said on CNN's State of the Union on Sunday. "I've never been an agent of a foreign power by any stretch of the imagination," he added. Page did acknowledge participating in meetings as an informal adviser to the Russian government around 2013 ahead of the G20 Summit in Saint Petersburg. "I may have, back in the G20 when they were getting ready to do that in St. Petersburg, I might have participated in a few meetings that a lot of people, including people from the Obama administration, were sitting on, and Geneva, Paris, et cetera, but I've never been anywhere near what's being described here," he said. Page has not been charged with any crime. The FISA warrant process is one of the most secretive processes in government. The Foreign Intelligence Surveillance Act was passed by Congress in 1978. Rep. Adam Schiff, D-California, who is ranking member on the House Intelligence Committee, said in a statement Saturday that the released FISA documents show that the FBI and Department of Justice acted appropriately. "Even in redacted form, the initial FISA application and three renewals underscore the legitimate concern FBI had about Page’s activities as it was investigating Russia’s interference; DOJ’s transparency with the Foreign Intelligence Surveillance Court about a specific source; and that DOJ followed proper procedures in receiving approval from four different judges," Schiff said. Page is a central figure in the Nunes memo, which alleges that the FBI withheld key information from the judges who approved and renewed the bureau's application to place Page under secret surveillance. Who is Carter Page and what does he have to do with the Russia probe? The memo, released in February was written by Republican staffers on the House Intelligence Committee and is named after the committee's chairman, Rep. Devin Nunes, R-Calif. The memo has been criticized as partisan. A memo subsequently released by Democrats claimed that information from the dossier compiled by Steele, whose work was funded by a law firm connected to Hillary Clinton's campaign, was a small part of the case Justice Department officials laid out in seeking the Foreign Intelligence Surveillance court's permission to eavesdrop on Page and in renewal applications. The New York Times reported in May that at least one government informant met several times with Carter Page, and George Papadopoulos, a former Trump campaign foreign policy adviser. It was revealed last October that Papadopoulos had struck a cooperation agreement with Mueller, pleading guilty to lying to federal agents about his contacts with Kremlin-connected Russians. The controversy of the FISA warrant for surveillance on Page comes amid an investigation by special counsel Robert Mueller, who is investigating Russian interference in the 2016 presidential campaign and whether there was any collusion with people connected to the Trump campaign, among other matters. Trump has repeatedly denied any collusion took place, and on Saturday tweeted "No Collusion, No Obstruction," and the president again called the Mueller investigation a "witch hunt."